Activity 6.2: What do you think about ocTEL? With a mixture of sadness and excitement we enter the final official week of ocTEL. Since the end of April it has been a joy to see participants of ocTEL contribute over 300 blog post, 800 forum contributions plus reaction and interaction in other spaces. The final week of ocTEL is on enhancement, evaluation and reflection. This is something the ocTEL team will be doing over the next couple of weeks as we assess what went well and what could be improved if ocTEL is run again. To that end we’ll be contacting you again towards the end of the week with a course survey and outlining our next steps. This final week is slightly different in that our webinar is scheduled for 12.30pm today (details below)! Hopefully this will give you a chance to engage with the content for this week earlier giving you more time to look back at previous weeks and see if there are any activities/resources you’d like to revisit in the final official week. We’ve covered technology in ocTEL; we’ve covered learning. This week we’re focusing on enhancement – what shapes it takes, and how to achieve it – and evaluation – how we can decide that our interventions have been successful. As you will all be at different stages in terms of introducing/working with TEL, we offer different routes through the week depending on which core activity you undertake. reflect on how your experience of the ocTEL course has compared with expectations, and how you can best build on this experience. Choose between focusing on enhancement or evaluation. or this 9 minute video about one MOOC model (this is usually referred to as the xMOOC model, in contrast to the cMOOC model, which ocTEL is closer to). taking the learners’ perspective in getting a sound, rounded, education with minimum financial outlay. Describe those situations and identify any potential tensions or conflict in these situations between the goals of effectiveness and efficiency. Share your thoughts on your blog or via Twitter (using #ocTEL tag), on this forum topic, or via the JiscMail list. Think about a TEL initiative you’ve been involved with. How did you know it had been successful or provided benefit? Was the initiative evaluated? If not, why not? If yes, what evaluation took place, what did you and your stakeholders need to know and how were the findings used? Reflect on the different ways you have come across for evaluating the effectiveness and impact of TEL, using the headings below. What are the advantages and disadvantages of each approach? Monday June 16 at 12.30 – 1.30 (BST). This webinar will include three guest speakers who will talk about the enhancement and evaluation of a major example of TEL which they have been involved in. Our three examples will include one at module level, one innovation based on introducing new devices, and one based on an overall institutional strategy. James McDowell is University Teaching Fellow in the School of Computing and Engineering at the University of Huddersfield. He will be talking about the development of work which won him the 2011 ALT-Epigeum Award for the Most Effective Use of Video. This award recognized the important contribution he has made to the enhancement of student learning through his use of video feedback – http://eprints.hud.ac.uk/19915/ . Read why productivity and sustainability in HE is an issue, as suggested by The Economist’s take on “Baumol’s cost disease”. Check out a few of the resources listed below (e.g. on evaluation and costing). On your blog or via Twitter (using #ocTEL tag), on this forum topic, or via the JiscMail list, note your initial impressions about which strategies look promising or unpromising to you. We invited you at the start of this course to think about big questions and we hope that you have kept in mind what your question(s) were. As we approach the end of the course, we’d like to encourage you to revisit your ‘big TEL question’ and see how your view of it has been changed and reframed by the course (and indeed whether it is still the same!). Share your thoughts on your blog or via Twitter (using #ocTEL tag), on the original forum post if you made one or this forum topic, or via the JiscMail list. The materials for the course including the recordings of live sessions and the forums will remain on the ocTEL website so that you can refer back to them later, if you have missed something or not had time to complete any of the activities. This is additional content and an activity to enable you to explore topics that are really relevant to your own practice. Explorer activities are part of the course, so we’d like to encourage you to share your ideas on your blog or via Twitter (using #ocTEL tag), on this forum topic . Find an example of innovation in TEL which interests you. You can use other ocTEL participants as a resource here as they may know of innovative practice in whatever curriculum area you wish to explore. Other sources include websites from JISC, HEA etc. and awards for innovative practice such as NTFS and those from ALT, the Guardian and THES. – what was the impetus and rationale behind the innovation? – what has the innovation achieved so far in terms of student learning? – what has its impact been on the staff involved and the wider institution? – how do you know it has had this impact? What evaluation strategies and methods have been used? Write a brief commentary on the outcomes of this conversation and publish it via the blog or other methods you have been using on this course so far. We recommend you check your summary with the innovator before publishing to make sure that you have interpreted everything correctly. Our webinar will look at examples of enhancement in TEL in higher education and compare them in terms of their objectives, the relative success of the intervention, and how it was evaluated. These examples and their discussion will mean different things to you depending on where you’re starting from and what ambitions you have for your educational work. Here are some of the challenges that you might like to tackle this week. How can we most efficiently help more people access learning experiences? How can we take advantage of TEL and create a richer learning experience within resource constraints (e.g. by redesigning the curriculum and/or cutting overheads)? During this week you will identify commonly used methods of evaluation and review existing evaluation tools. 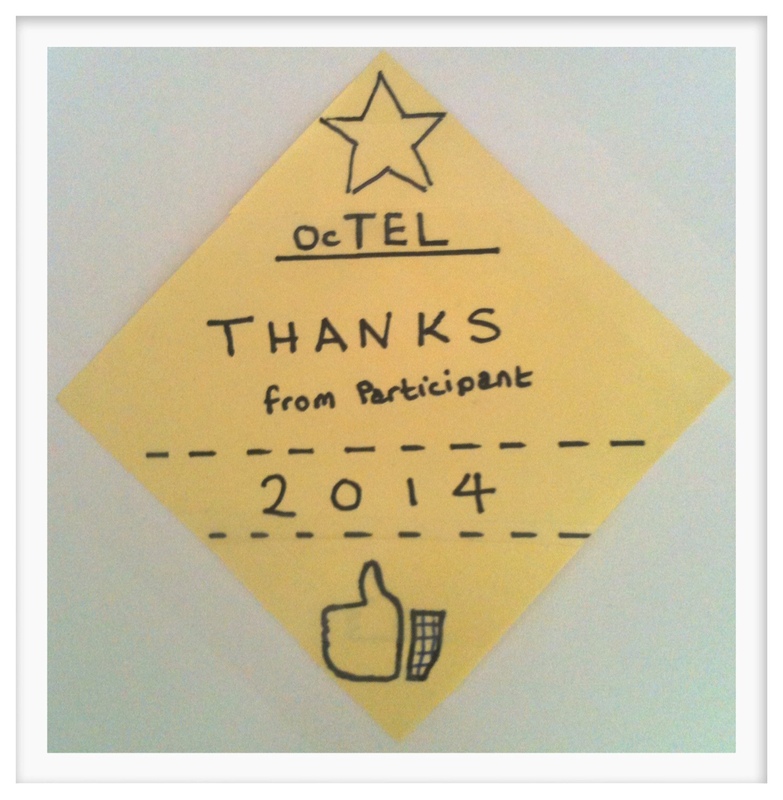 We hope that you will be able to find time to finish the course by discussing your own experiences of ocTEL. This is not only about you and the course, but also about how we can make things better next time round. As you know, the course was designed, written and largely supported by Members of ALT (see who’s who on our ocTEL team page) and your feedback can make a big difference to how we develop and run the course in future. Integrative – a combination of the summative and illuminative approaches. The idea of getting maximum learning for minimum cost is met with wary scepticism in many quarters. It smacks of putting managerial values ahead of teaching, or of cutting costs to the point where the learning process becomes brittle and no longer has the agility and resilience to deal with the unpredictable demands of teaching (see David Noble’s paper, linked above, for an example of this critique). Issues of deskilling teaching work or filleting the soul of education institutions are not trivial, and you can focus on them this week if you wish. But this is also an opportunity to ask about the different ways that learning and teaching are enhanced in Technology-Enhanced Learning. Do they result in learning outcomes that are richer in themselves, accessible to a wider range of people in a wider range of contexts, easier to achieve, or cheaper to accomplish? Some enhancements are incremental, some are transformational. Sugata Mitra’s work on using technology as part of “Self Organised Learning Environments” in contexts where there is a lack of good quality teachers hints at radically new models for supporting learning. Realising the enhancements that may be possible depends on an understanding of learning context. We appreciate straight away that it’s cheaper and safer for pilots, dentists and surgeons to learn their skills using simulations, but other contexts of learning present different challenges. This week you have the opportunity to select a context of your choice and explore what kinds of enhancements might be possible to make the learning more productive for more people. You can make your own value judgements. I was last last week how long it would take me to design a blended course for low literacy and ESOL students with little experience of using computers let alone the internet. As an FE college as a whole we are committed to putting part of all the courses on-line. Partly no doubt because of cost but partly to prepare students for an on-line world. However, for a low literacy adult student to try to attend a blended learning course in a non-native language seems to have little benefit (if I’m wrong please contact me). That said, this year they have enjoyed TEL in the classroom where I (and more ICT experienced students) can support them. They have enjoyed using websites such as vocaroo and google docs for peer assessment. With the gamification of OCTEL grabbing my interest, I thought it only fair that I repay the OCTEL team with a badge of their own from me. Enjoy you have earned it!